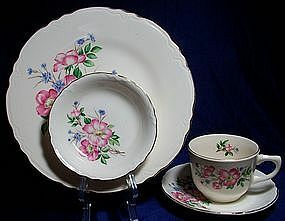 Scio Dinnerware Circa 1950's, unnamed pattern, features pink and blue florals with a "Ranson" shape. I do believe that the Scio Co bought prefinished dinnerware pieces and finished them with their own decals. Many of the Scio Co's shapes are the same as Homer Laughlin, just to name one. Such is the case with this pattern. The shape is exactly like the Virginia Rose shape of Homer Laughlin. However, this is Scio and is a nice set of dinnerware pieces. I have the following available: 6 9 1/4" plates 6 7 1/4" dessert plates 5 5 1/4" dessert bowls 6 coffee cups 6 saucers 1 12 x 9 oval platter 1 8 1/2" diameter vegetable bowl. Price of the set is 2.00 per piece and 3.00 for the platter and vegetable bowl.